What some people miss on Andy McGrath is he would be in the top 5 guys in the entire comp to bring into your team from a potential leadership role. The guy is next level. He is probably the best young leader in the AFL. You don’t need a title to hold that role and he will get a title soon. Also, the guy is a winner and competitive beast. I honestly wouldn’t have asked for more and I think he will exceed expectations. the former No.1 draft pick seems destined to become a full-time centre-square player in 2019. What’s this? 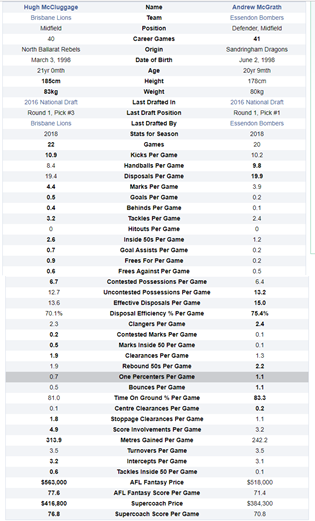 Has the AFL deemed that someone else was actually the #1 pick that year? Sorry to say but we could have picked Taranto, McCluggage or McGrath and walked away winners, at this moment they have all been as good as each other in their best games and all have done an amazing job for their teams. All 3 could be picked at no1 if it was redone right now, 3 excellent young players. If anything Brodie and SPS are the 2 falling behind. 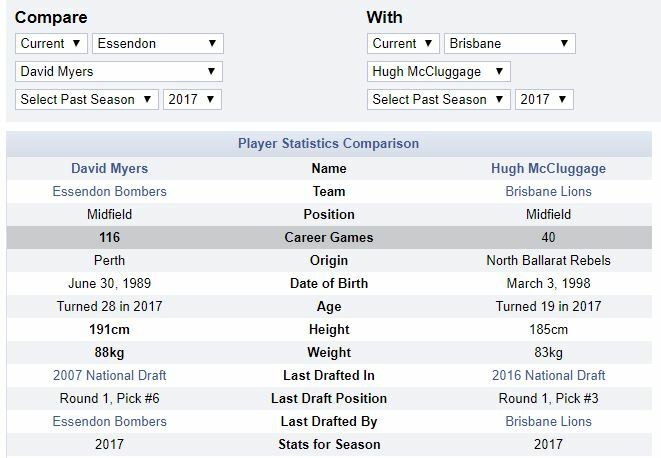 I still want McCluggage, that game where Brisbane lost to the Roos last year by 3 points and McCluggage had 27 possessions and 3 goals was great. Oh, but I saw it! Taranto wins out on the dreamy factor. This could keep the stats nuts engrossed for hours. 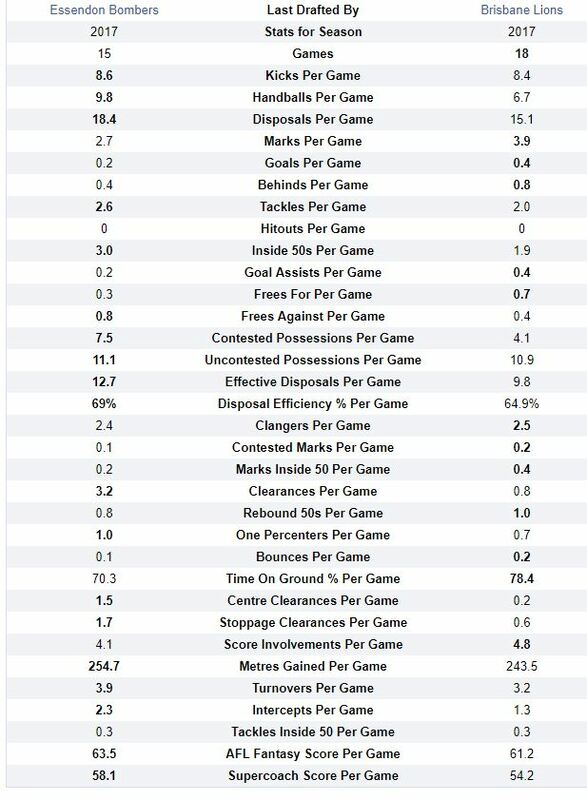 Guess the player by their stats. No fun once you’ve attached player names to the charts. Back to implying stats are useful. Don’t look Essendon fans, Myers about to be handed a belting. Could Taranto or McCluggage handled being number 1 though? We will never know but I got the feeling McGrath would have the best mentality out of the lot. I liked Taranto, and still do. 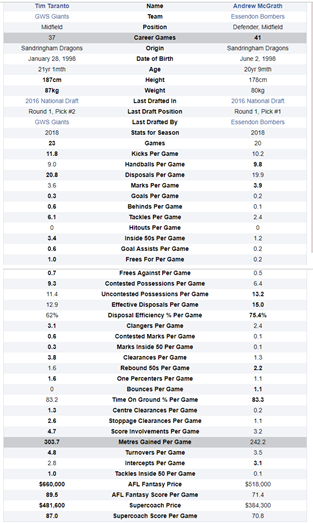 So you take Heppell, Merrett, Zaka, Smith and Shiel and then you throw in Raz, Stringer and Walla in short bursts with Parish, Langford and Myers to round out the rotations AND THEN you add #1 draft pick, Rising Star winner and all round good bloke Andy McGrath in as the icing on the cake? To paraphrase an infamous astronomer…it’s very very difficult to see where we’re going to lose a (real) game.